Results-Based Software Management: Achieve Better Outcomes with Finite Resources Effective software development is no longer merely an IT concern: today, it is crucial to the entire enterprise. However, most businesspeople are not ready to make informed decisions about software initiatives. 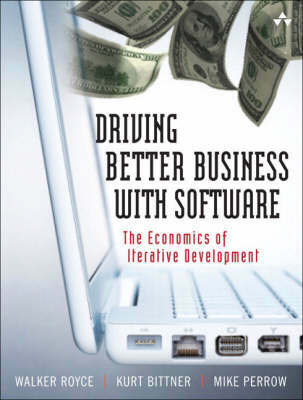 The Economics of Iterative Software Development: Steering Toward Better Business Results will prepare them. Drawing on decades of software development and business experience, the authors demonstrate how to utilize practical, economics-based techniques to plan and manage software projects for maximum return on technology investments. The authors begin by dispelling widespread myths about software costs, explaining why traditional, "engineering-based" software management introduces unacceptable inefficiencies in today's development environments. Next, they show business and technical managers how to combine the principles of economics and iterative development to achieve optimal results with limited resources. Using their techniques, readers will learn how to build systems that enable maximum business innovation and process improvement-and implement software processes that allow them to do so consistently. Highlights include * How to repeatedly quantify the value a project is delivering and quickly adjust course as needed* How to reduce software project size, complexity, and other "project killers"* How to identify and eliminate software development processes that don't work* How to improve development processes, reduce rework, mitigate risk, and identify inefficiencies* How to create more proficient teams by improving individual skills, team interactions, and organizational capability* Where to use integrated, automated tools to improve effectiveness * What to measure, and when: specific metrics for project inception, elaboration, construction, and transition The Economics of Iterative Software Development: Steering Toward Better Business Results will help both business and technical managers make better decisions throughout the software development process-and it will help team and project leaders keep any project or initiative on track, so they can deliver more value faster.